What a month December was! The busiest THHN has been since it started, as well as families affected by serious illness and bereavement enjoying some amazing holidays, we were very busy with lots of events. So we have a jam packed newsletter for you. THHN hosted the St Marychurch Christmas street party on a slighlty damp Tuesday in December, but the weather did not dampen anyones spirits. The amazing Mr and Mrs Christmas came along to our very own Santa’s Grotto and met loads of excitied children. Elsewhere at the party with a big thank you to Babbacombe Model Village and help from some friendly elves we had snow. The party saw The Breeze host the music stage, playing Christmas songs and announcing the live acts we had lined up, a big thank you to all who helped on the stage and to the acts who gave up their time to perfom on the stage, The Robbie Williams Experience, Starry Eyed Ellie Goulding Tribute, Ukuelle Strummers and the South West Choir who helped keep the crowds entertained. We also had a host of special guests visiting including Olaf, Elsa, Captain Jack and Cavog from Kents Cavern. The night also saw some amazing stilt walkers kindly arranged by St Marychurch Rent Agency. A very big thank you to the traders in St Marychurch, not only did they donate some great prizes to our raffle, they also took part in our window treasure hunt, a game for children to search for Santa in the shop windows to reveal a message, the winner won a large cuddly reindeer donated by Teddy Mountain UK. Thank you also to United Vapour who provided the electricity for the stage and the Dolphin Inn who proivded electricty for the Snow Machine. The event raised over £700 for THHN. 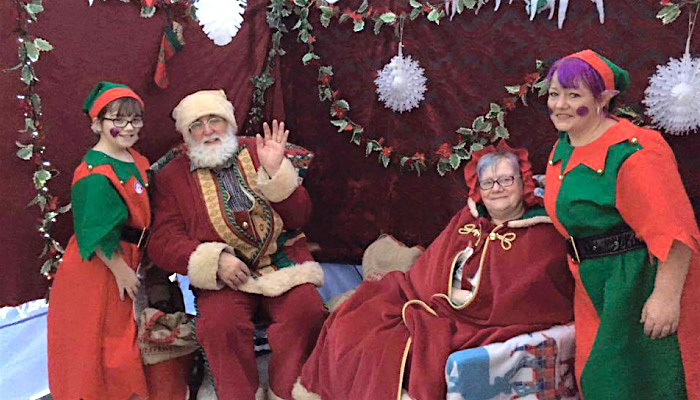 The first Sunday in December saw the first sighting of Santa at Torbay Velopark, then another and another, soon the Velopark was teeming with Santa’s as people braved the wet and windy weather to take part in the first event THHN Santa Sunday which was sponsored by Pennywell Farm. The first event was the Santa Fun Run, people of all ages took part all dressed as Santa, from the very young being pushed in buggies, the young at heart and the not quite as young being pushed in wheelchairs, it really was an event for all. Next up was the Santa Cycle, a two lap cycle ride around the Velopark while dressed as Santa, again all ages took part. For those wanting an extra challenge there was also an option to do both in the Santa Duathlon. A big thank you to all the volunters who helped on the day, the staff at Torbay Velopark for lending a hand on the day, Pennywell Farm for sponsoring the event, The Breeze for coming along and playing some Christmas Music for the participants and Thorn Removals for helping move our equipment to and from the Velopark. We are extremely grateful to Paignton Pantomime Productions who chose THHN as their nomianted charity for their production of Jack and The Beanstalk, they held a collection for THHN after every performance and raised an amazing £1,500. A big Thank you to all at Paignton Pantomime Productions, The Palace Theatre and all the THHN volunteers who went along to help with the collections. Trustee Martin Brook was invited along to see the final perfomance and go on stage to be presented with the cheque. Our good friends at Pennywell hosted their Nativity evenings in December and raised some money for THHN, these popular evenings were amazing with the children getting involved and dressing up. They raised £512.05 for THHN. Bounce Torbay held a christmas childrens fun day at the Redcliff Hotel in Paignton, with lots of fun and games for kids to enjoy, bouncy castles, didi cars, Olaf, Memory Maker Man, games and lots more, a great time was had by all and the event raised £302.77 for THHN. A big thank you to all involved. The Cockington Caper took place in December on an overcast Saturday morning, the rain in the previous weeks meant the runners were in for a muddy time, the Caper is organised by Matt Day and The Barnabas Sports Trust, who chose THHN as their charity for this years event again. A big thank you to Matt and Rob the orgainsers, they presented THHN with a cheque for £292. The Caper saw 14 THHN Runners of all abilities take part, taking on this Hilly, Muddy tough 8 and half mile course, they all enjoyed the run, for Lizzie Hurford and Samantha Hill it was their longest race event so far, a big well done to all the runners. Here is just a selection of holidays we gave to families affected by serious illness and bereavement in December. December saw a family who were referred to THHN from Victim Support have a trip to Disneyland Paris, this was the result of a very kind offer and fundraising by Miles Leeson and Peak Performance Gym, who kindy raised the money to pay for the families accomodation and entry into Disneyland Paris, THHN helped the family with a travel grant to fly them to Paris for their holiday. In December we also welcomed a family to stay on a special festive THHN memory making holiday at Coastguard Cottage in Plymouth, a huge heartfelt thank you to owner Johhny Fraser for providing such a special gift! The family had an amazing time in such beautiful accommodation and surroundings. A huge heartfelt thank you to our business supporters Teddy Mountain UK, Halletts the Bakers, Luscombes Butchers of Torbay, Riverford Home Delivery and Daisy Cakes for all donating fantastic food hampers and gifts for the family to enjoy during their stay. A big thank you to the Tesco stores in Torquay, Newton Abbot, Paignton and Kingsbridge who all got together and held a toy collection for THHN, they received masses of toys, which they have donated to the Charity. A big thank you to all at Torquay Police station who collected for THHN and held a raffle to raise some funds for THHN, they raised an amazing £360.27 a big thank you to all the companies that donated a prize for the raffle. A big thank you to Samuel Johnston who raised £112.80 by taking part in the Santa Sunday event. Santa made an appearance in Hoopers before Christmas and had breakfast with some children in the Zest Restaurant as a Breakfast with Santa event, the event raised £250 for THHN. A big Thank you to all at Hoopers. Santa, what a busy person he was this year, also visited The Cary Arms, who held some christmas events for THHN, a big thank you to all at the Cary Arms. Also a big thank you to the person who wishes to remain anonymous for not only donating Two amazing Star Wars Lego sets for a Christmas Raffle at our THHN Memory Makers shop in St Marychurch but also for donating to help pay for some of the costs of the Christmas Street party. More details coming very soon for this exciting new Bi-Annual quiz night. THHN also have Team THHN Charity runner places availble on the Torbay Half Marathon, please email brian@thhn.co.uk for details, will you be in this years Team Photo? The City to Sea is a fantastic event, comprising a 26.5 mile Marathon, which you can run or walk and a 55 Mile Ultramarathon, team relay options also available. All finishers get a fantastic medal, tech t-shirt and free fish and chips from Hanburys Famous Fish and Chips. The Festival of Fun takes place at the finish line on Babbacombe Downs, it is a family fun day, with lots to do and a live music marquee to keep you entertained. Phew, we told you it was a mammoth newsletter this month.